This page showcases our selection of digital price computing scales. Most are class III NTEP legal for trade certified scales. Most of our price computing scales are from china but so is almost everything that we buy these days. We are often asked, in what fields are price computing scales used? The answer is usually they are used for weighing items like apples or berries by the pound. The operator types the price per pound that they wish to charge, place the items on the scale and the scale can calculate the total costs much faster than you can get out your calculator. 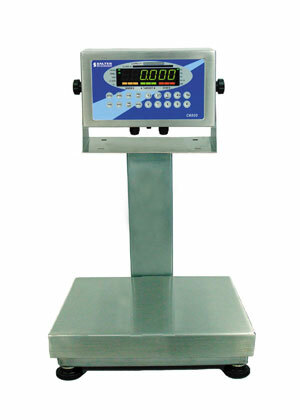 Torrey price computing scales can weigh items up to 40 lbs. It's NTEP Certified legal for trade and operates off 120 VAC power or rechargeable battery (included). Based on average use, battery life is 30 hours before a recharge is needed. In order to save the battery, the PC-40L price computing scale has an auto power-off feature when operated on battery. The scale increments are +/- .01 lbs. Stainless steel construction with wipe-clean touchpad surface are additional quality features of the Tor-rey PC 40L small price computing scales. 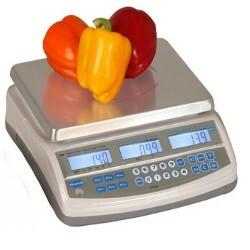 These commercial retail scales are ideal for farmer's markets, strawberry farms and pick your own berries, fudge shoppes, butchers, or any place where you sell items by the pound. 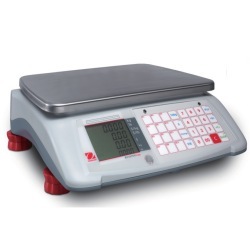 Another product we highly recommend is our CAS and Brecknell retail scales. Known for uncompromising quality for the Independent Retailer, the PC Series from Brecknell is a simple and cost-effective price calculating scale has been developed for independent retailers by Brecknell. The PC series can be used indoors in a candy shoppe or outdoors at a farmers market using 115VAC power or battery power. It has a compact footprint to save counter space and allow easy movement, and features a backlit LCD display, programmable price look up keys, and a weighing capacity of 30 pounds or 60 pounds. 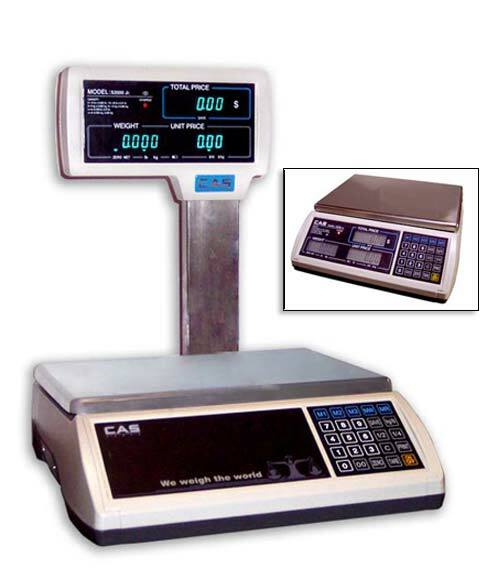 CAS S-2000JR is a general purpose price computing scale for direct sale of commodities in stores such as: supermarkets, delicatessens and groceries. The S2000JR has proven to be a top of the line fully featured retail price computing scale. The Model S2000 Jr. is available in several different configurations with the built in rechargeable battery, you can easily use the scale indoors or take it to the farmers market or produce stand. S2000JR features display on both operator and customer side and is NTEP approved legal for trade. Connect with the optional label printer for a complete weighing system. Platform size: 11.5" x 14"
The sleek, attractive NTEP Certified commercial scale can meet virtually every weighing need on almost any counter. It's the replacement for the very successful XRT and RE series that you've seen over the years. This scale features an easy to read display -- displays are on the operator's side of the scale as well as displays on the customer's side. The precision load cell gives superior reliability and complete accuracy with every use. Battery power extends the scale's versatility outdoors. The Aviator 7000 is easy to install, easy to operate, easy to clean, and requires minimum maintenance...everything you want!